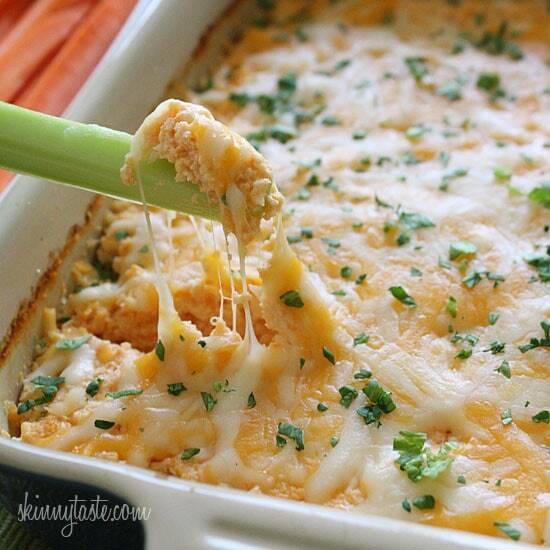 Move over buffalo wings, this hot & cheesy shrimp dip will have everyone going back for more! 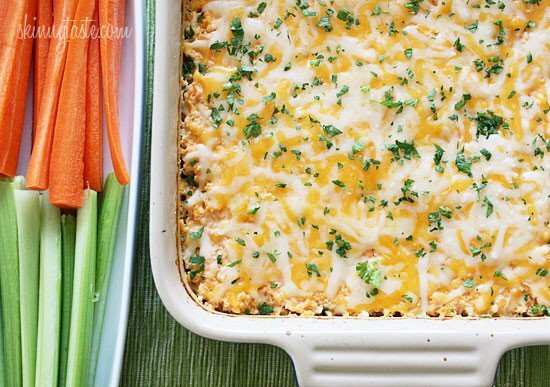 This buffalo dip is perfect for super or any party appetizer. 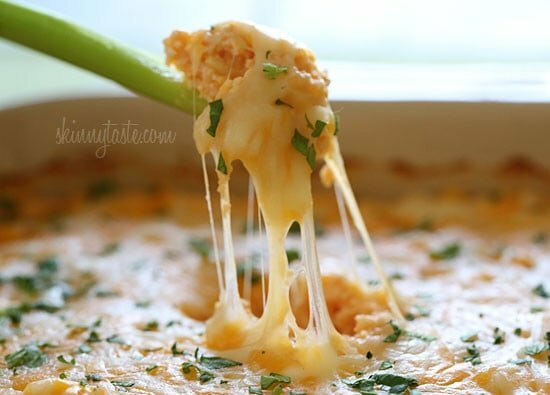 A few more of my favorite party dips are the Buffalo Chicken Dip, Mini Bell Peppers Loaded Turkey “Nachos”, Hot Spinach and Artichoke Dip, and Baked Buffalo Chicken Jalapeño Poppers. Super bowl Sunday is just a few days away! I have tons of skinny appetizer recipes you can make, but I wanted to add one more, because quite honestly, what’s football without the buffalo dip! 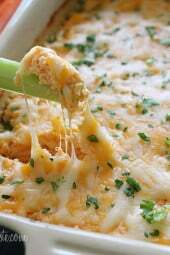 This was inspired by my Buffalo Chicken Dip, I wanted to try a shrimp version topped with melted cheese, and we loved how it turned out! Serve this with crudites to keep it light; celery and carrot sticks are the perfect vessel for scooping up the buffalo goodness! You can even add some baked chips to the table, baked pita chips work great. I minced some of the celery leaf for garnish for a little color. Enjoy! ***I made this a second time without the yogurt and I found I liked it better (less liquid), so I am removing the 1/2 cup of yogurt in the recipe below. Lightly spray an 8 x 8 or 9 x 9 baking dish, or even a pie dish with cooking spray. 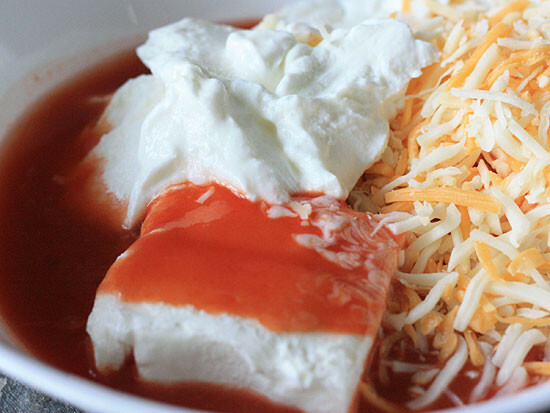 Combine the first 4 ingredients together and 1/4 cup of the cheese; mix until smooth. Add the shrimp; mix well and put in a small oven safe dish. Bake in the oven until hot, about 20-25 minutes. 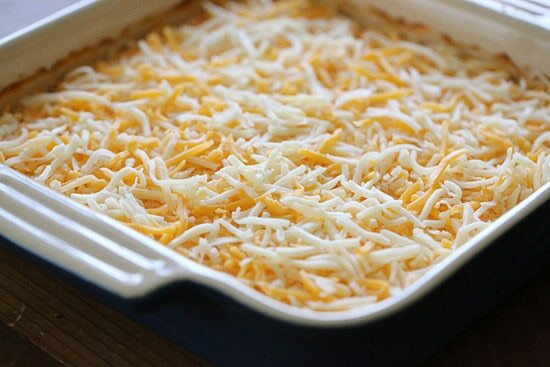 Remove from oven and top with remaining cheese, bake until melted, about 4-5 minutes.